So i really like ”shore slow”, “shore jigging” or”Shoajiging” as its called in Japan (If you want to split hairs, its sometimes talked about as two different diciplines). Its of course nothing new in that sense.. But its been “refined”, as a lot of things usually become when Japan gets involved... 😊 I use it nowdays solely for my shore fishing after Searun trout, Mackerell, Cod and other species from shore. But in short its a collective name for fishing specialized Jigs from shore. The Slow blatt cast series of jigs is an example of jigs specially made for shore slow jigging. They are available in 5 models, that all behave differently on the pull and on the fall. They all come with assist hooks as alot of fish who bites on pull, attack the front of the lure, while fish who bite on fall, attack the rear of the lure. They sink with 60 to 90cm per second depending on model. Slow blatt cast wide - Sinks with 90cm/Sec and drops from the "bottom" part as its center of gravity is on the back half of the body. In other words it drops back "out" from the shore with a fluttering motion on fall, which sometimes can be very efficient. Slow blatt cast Up! - does a left/right up motion on pull, nice "3-dimensional" motion on pull as it also curves, not just raises on pull.. Slow blatt cast slim - Sinks with 80cm/Sec and drops straight down, falls flat with fluttering as the center of gravity is completely in the center of the lure. Slow blatt cast long - More straight left/right motion on pull then Up! Slow blatt cast oval - Sinks with 60cm/Sec and drops straight down, falls flat with fluttering as the center of gravity is completely in the center of the lure. 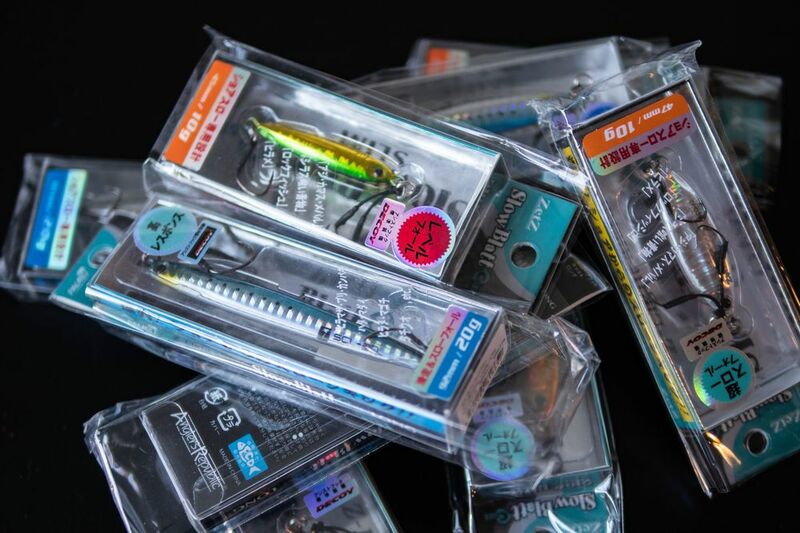 Slowest falling jig due to its flat, keeled shape and light Zinc metal body. To simplify so is shore slow sometimes divided into 3 "classes"
60gr and up "Heavy shore jigging". lines PE2 and up. The line classification are of course not any hard rules, more recommendations. Type of fish and terrain of course also impact choice of lines. The 5 slow blatt cast jigs come in weights from 10 to 60gr and have rods that match up well (And are specifically designed for shore slow jigging actionwise) to those weights and the different "classes" of shore slow jigging. The Shore Gun Evolve SS, a rod specially made for Shore slow jigging. This is a rod of really high quality and the action is beautiful, casts miles and got an action that handles jigs beautifully. You use a leader of flourocarbon (Some use nylon because of its shock absorbing qualities) due to its abrasion resistance, roughly 1.5-2 meters in lenght and keeping the Pe-line/Flourocarbon knot out of the rings. To minimize the rotation of the jig during the cast a smoth pendulum style cast is most often used.